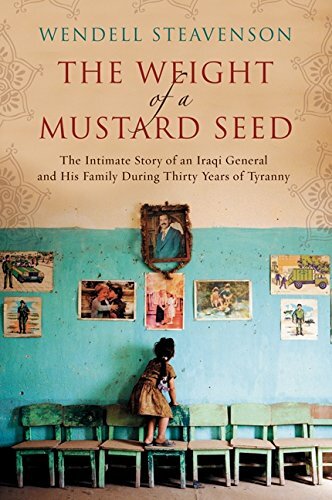 The Weight of a Mustard Seed is an unprecedented and intimate account of Iraqi life under Saddam Hussein’s brutal regime, revealed through the tragic story of one of the dictator’s loyal generals. Journalist Wendell Steavenson writes thrilling nonfiction with a novelist’s flair, offering a new perspective on life inside a totalitarian regime that is as moving, compelling, and dramatic as The Kite Runner and The Bookseller of Kabul. General Kamel Sachet was a favorite of Saddam Hussein's, a hero of the Iran-Iraq war, head of the army in Kuwait City during Desert Storm, governor of the province of Maysan, and father of nine children. When author Wendell Steavenson became intrigued by his story, she began with a few questions about Sachet and his fellow Baathist loyalists: "Why had they served such a regime? How had they accommodated their own morality? How had they lived? How had they lived with themselves?" Her journey to find these answers took five years, and an accumulation of facts, opinions, fears, confessions and suspicions from Sachet's family, friends, and enemies. The result is not just a gripping account of one man's rise and fall, but a vivid and compassionate portrayal of the Iraqi people. As Sachet rose from policeman to Special Forces officer and then General, he made more and more sacrifices to remain in Saddam's good favor. Steadfast in his loyalty to God and his President, Sachet attended military executions and endured his own imprisonment as Saddam's behavior took increasingly paranoiac and power-crazy turns. But when it came time for Sachet's sons to do their military service, he refused to let them join the "criminal" organization to which he had given his life. Kamel Sachet realized, too late, that he'd become a participant in the terror regime that had strangled his county and destroyed its people. Through his story and the stories of those around him, Wendell Steavenson shows the choices Iraqis have had to make between exile and collaboration, God and jihad. Here are the Iraqis behind the headlines and the tragedy begotten of unintended consequences. And here is the first full-length narrative from an immensely talented journalist who has already been compared by critics to Bruce Chatwin and Ryszard Kapucinksi.